Lots of exciting car loads of loveliness made their way to The PlainStitch Workroom this week but my front room is now mercifully (almost) empty of boxes and bags and baskets, and the Workroom is bursting at the seams with colour and pattern. How many more sleeps til Thursday? PlainStitch has a new home. 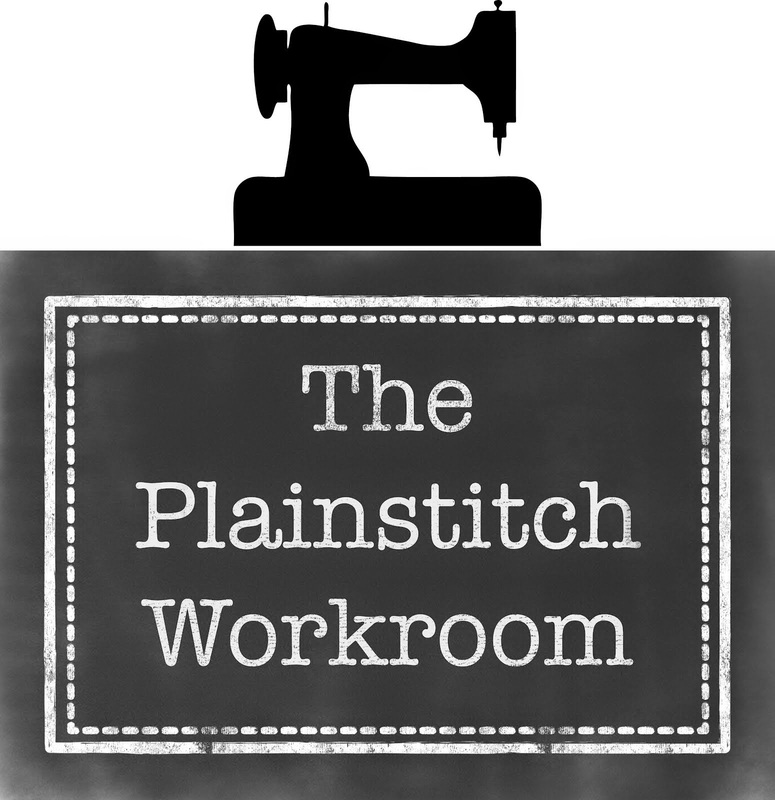 Announcing the opening of The PlainStitch Workroom in Wendover, Buckinghamshire. We've been lucky enough to be offered this lovely sunny inspiring room in the heart of Wendover above the Christopher Pallet estate agents in the High St.
We have the first floor in this lovely Georgian building. Huge sash windows, lots and lots of natural light, a cracking nosey view of the High Street, and finally a place to fill to the brim with permanent loveliness. Helen and I have been busy painting, and making, and generally transforming it into an inspiring home from home for our classes. We will still be teaching our bigger classes in our usual halls, but the new Workroom will allow us to run classes more regularly, at times that suit you. We will also be able to offer more 1:1 and small group tuition, more repeats of popular classes, so less issues with classes selling out before you've even heard about them! We will also be able to stock a wider range of fabric, patterns and sewing supplies, and to expand our popular hand picked bundles range (so excited about that - my favourite thing!). It will also give us a space to show off permanently the quilts and projects for classes, we will have lots of books and magazines for you to browse through and will be open for Sewing Mornings where you can drop in and get away from normal life and get on with that project you've been wanting to get your teeth into. 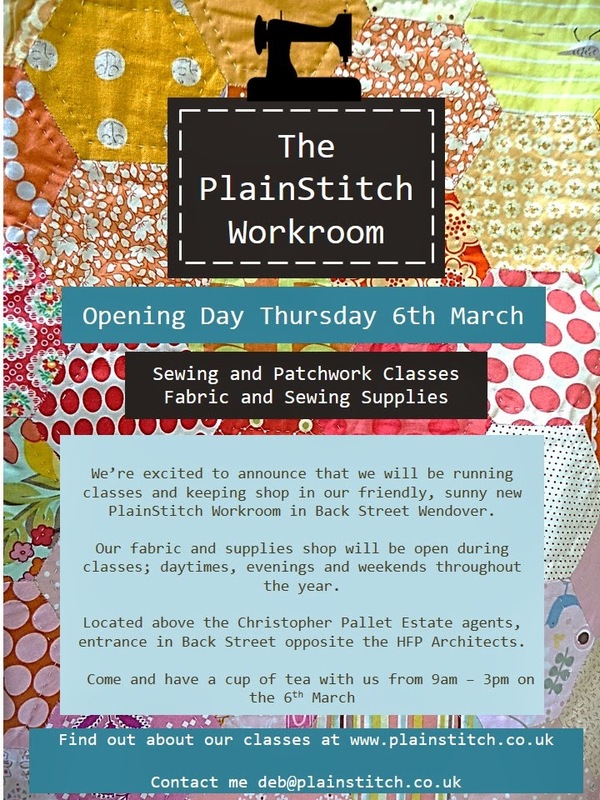 We will be open all day on Thursday 6th March serving cakes and cuppas and hoping to welcome all our sewing friends to our new sewing home. Do drop in, see what we do, and say hello. We will be open from 9.00am - 3pm. Visit us in Back Street, through the gate and up the stone steps, above Christopher Pallet Estate Agents and opposite the HFP Architects. We ran this class in Jan - it sold out in a week, so we ran it again in Feb and the same happened. 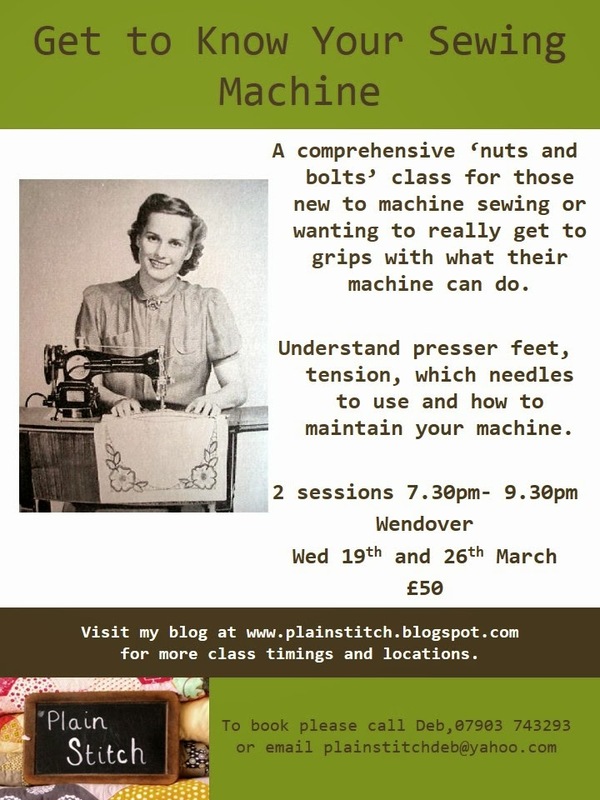 So back by popular demand in March our nuts and bolts introduction to your sewing machine class. This class is great if you are new to sewing, or have a new machine, but it's also great if you've got into a bit of a rut with your machine and want to be re inspired. This class will run on Wednesday the 19th and 26th March from 7.30pm - 9.30pm in Wendover. Drop me a mail if you'd like a booking form, and dust off that sewing machine and get ready to get that pedal pumping again for spring! This months evening Bee at Whitewaters Deli Cafe in Back Street Wendover, on Tuesday 25th Feb from 8pm. Get there early as it does fill up quickly! Half term. What a difference a week makes. Last week it was all mud, mud, rain, repeat here. We have quite a menagerie (dog, cat, chickens,ponies, 3 kids) which means I get more than my fair share of time with the mop and the (once) cream kitchen floor tiles when the weather is like that. Today, just a week, but a whole season later, the sun is shining, my blossom trees are heralding spring and I'm getting some long awaited projects starting to come to fruition. There's been lots of happy making here this week and without the relentless ticking of the school run clock I have managed to get a lot of hand sewing jobs done that usually seem to get put to the bottom of the pile. I think it's as you know before you even start that you're not going to get to tick that job off of your list in the 45mins you have before school is out so I tend to keep on procrastinating. I have been working on this quilt since the spring last year. The pattern is an adaptation of my own Modern Applique pattern that I teach as a class at PlainStitch. I made a 9 block version originally for the class using the relaunched Flea Market Fancy prints. I had also made a softer vintagey version in soft greens and pinks here. I had had this stack of fabrics pulled for months. I tried out a pieced tulip block with them but nothing was really working out, doubt crept in. The yellow was a bit too acid and I wasn't sure about my fabric picks. I had planned this to be 'Atomic', as in mid century, like my Nanas groovy bedspreads from the 1950's. Full of new age optimism and bold colour choices. In the end the Ode to Orla block of my pattern ( middle right) decided it for me. I wondered how cool it would look in these Orla-ish colours, and then Bang, I was away. I made a 6 block version of my pattern as an example for my class as 9 blocks can be intimidating to new hand applique students. I added some extra applique to the sashing too. I quilted my favourite random circles. This quilt was made almost entirely by hand, hand applique, hand quilting, hand finished binding. I love this kind of quilt that takes time to come to fruition, it's been a pleasure to make and actually a little bit bittersweet to finish it. That's the thing about hand swing, it's never overwhelming, it never feels like a 'job' to be completed, it just gets chipped away at, picked up and put down again,gradually, imperceptibly, finished. I have the perfect place for it to get shown off, somewhere vintagey with cool grey walls and splashes of mid century colour .I can't wait to show you what else I've been working on this half term. Watch the blog for more. NB: The Modern Applique class starts again on 2nd May, come and join us, and check out last years finished class quilts in my Students Gallery page. village down a no through road, the hall tucked away down an unadopted road. The only view is fields. The sunshine refracted through the high leaded windows streaks across the polished wood floor. The room fills up, sewing machines, bags and boxes, projects new and long put aside, tea and cakes, chat and laughter, then quiet concentrated quiet. The kind of quiet that women who spend all day everyday listening to others, really can savor. the withdrawing of a naval force from action. Yep - it was all of that and more - thank you lovely Sewing Friends - we share a special bond. p.s Look at this amazing version of my Modern Applique pattern made by Helen who pretends shes not sewing each week but rustles this hand sewn beauty up while no one's looking! Isn't it gorgeous?! I'm lucky enough to have daughters and a son and as the start of the weeks blog post was very girl heavy I thought i'd better balance things out with a quick boy themed post! Its been a super busy week here at PlainStitch with so many exciting things bubbling away under the surface, new classes being planned and samples made for the autumn, lots of exciting classes underway at the moment getting students comfortable with sewing machines, making lampshades and exploring creativity with log cabins! Every now and then I get a quiet moment to sew something completely indulgent. Tomorrow I get a whole day of indulgent sewing at our termly PlainStitch Retreat Day. Its a joyous submersion in sewing! A whole free day, no dinners to cook, no chores to distract, just lovely company and lots and lots of sewing. I have picked up some fab cartoon fabric directly inspired by the fab cartoons that my little chap likes to fill pages and pages of note books with. I plan to make him a pillowcase so he's not left out of the pillow bounty that my girls are currently enjoying as they gradually snaffle all of the sample pillows I made for the Mums&Daughters Sewing Class in April! I do hope you get to do some quiet sewing this weekend too! I had the loveliest weekend sewing with my girls. We've been working on a special secret project. Those of you who know my girls, know that my oldest Miss Stitch is a dab hand with the sewing machine already and super creative, and Little Miss Stitch is chomping at the bit to catch her up! My Big Miss Stitch is 10 and has been sewing since she was really little, as you can't really avoid it in a house like mine ( her bear is always well turned out in an appropriate outfit!). However the last couple of years at school suddenly her friends have all started to take an interest in making things too - sewing got cool! Lots of them had sewing machines for Christmas, or are getting to use their mums, but we keep hearing from mums and daughters that they'd like a class together to get their girls up and sewing safely. We've been brainstorming which project would be best suited to a bit of basic sewing machine tuition, but still passed the 10 year old 'cool' test ( no 'lame' sewing here!) in terms of what was made. Miss Stitch has been working on a fantastic project this weekend. Which she has worked out a pattern for and planned all herself - and I think it's fabulous! I shall be appearing only as her assistant I think! It uses a half metre of fabric plus a contrasting fat quarter and is just perfect in how it comes together. 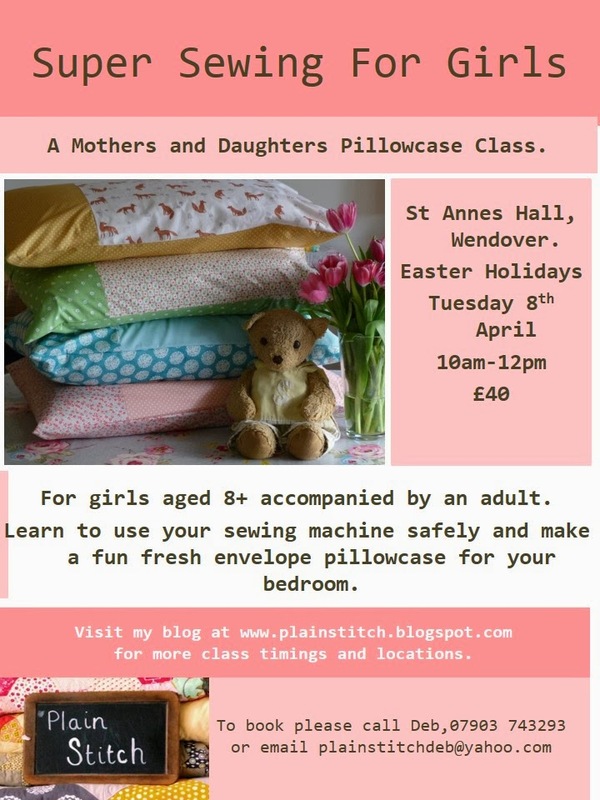 We will be jointly running a Mum & Daughters Pillowcase Class on the first Tuesday morning of the Easter school holidays from 10am til 12pm at St Anne's Hall in Wendover. We will be making these fun fresh envelope closure pillowcases. The class will be for girls ( or boys - it's just my son declined to be involved publicly in this one! Not Cool!) aged 8+ accompanied an adult. It can be Mum, Dad, Auntie, Godmother, Gran or even Big Sister if over 18. The class will be part basic tuition on how to use a machine safely whilst making the pillowcase so you get to go home with something fab for your room, that your practical mum will approve of too! Drop me an e mail if you'd like to book a place, I anticipate this will sell out quickly! ps all those pillows on her bed were too tempting for Little Miss Stitch to resist!